Chances are you're aware of crowdfunding. But what is all the fuss about? The JOBS Act is a controversial, multifaceted piece of legislation, shrouded in hype. Proponents promise that it will be game-changing for startups and small businesses, while detractors dismiss it as a Trojan horse of deregulation. So what does it all mean? Will the JOBS Act really change the world? It is really a license to print money? The following post aims to shed some light on the topic of crowdfunding. Back on April 5, 2012 President Obama signed into law the Jumpstart Our Business Startups (JOBS) Act (sorry, no relation to the late Steve), after being passed by an uncharacteristically bipartisan Congress. The JOBS Act aims to encourage funding for small businesses and startups by easing the regulatory burdens on smaller companies, and permitting a form of fundraising known as crowdfunding, made possible by online crowdfunding platforms (CFPs) like Kickstarter and RocketHub. The underlying premise is that small companies should be able to access funds from small investors without having to jump through the same hoops as giant corporations like Apple or Google. To learn more about the history of the JOBS Act, take a look at this nifty infographic here. The proof of concept for crowdfunding was established with the help of microlending platforms like Kiva, which connects people with money to impoverished entrepreneurs who lack access to traditional financial resources. The basic premise behind crowdfunding platforms, or CFPs, is not totally dissimilar. Like me, you’re probably most familiar with Kickstarter, the CFP launched in 2009 that has emerged as the brand name in the crowdfunding arena. Kickstarter is a funding platform for creative projects supported by fans in return for rewards. I was surprised to learn that a competitor, IndieGoGo, had actually launched in 2008, a year earlier than Kickstarter. With just a cursory web search, I found over 20 different CFPs – I’m sure there are many more out there, and even more in the pipeline. The JOBS Act eases the longstanding prohibition against ‘general solicitation and general advertising’ in securities offerings. The law will now provide a special exemption under the Securities Act for ‘crowdfunding’ offerings. The reforms will also enable both accredited and non-accredited investors alike to participate, albeit with separate rules and thresholds. Learn more about some of the law's key parameters here. While the coverage of crowdfunding tends to lump all CFPs together, funding can take a variety of forms, each with different implications. Platforms like Kickstarter, RocketHub, IndieGoGo and Go-FundMe use a model wherein project creators raise contributions from funders –- in exchange for rewards, rather than an ownership stake in the project. These rewards can take many forms –- copies of products, mementos, experiences -- pretty much anything that has value and satisfies backers. One idea underlying the rewards model is that the funds are considered business income, rather than securities (like common stock), which would fall under the auspices of the SEC. While Kickstarter focuses on creative projects and has publicly stated that it does not intend to offer equity, others like RocketHub and IndieGoGo may attempt to transition to an equity model, requiring strict adherence to the SEC's forthcoming crowdfunding rules. It appears that the JOBS Act -- and its pending SEC regulations -- are primarily concerned with equity and lending-based crowdfunding platforms, which more closely resemble traditional securities offerings. 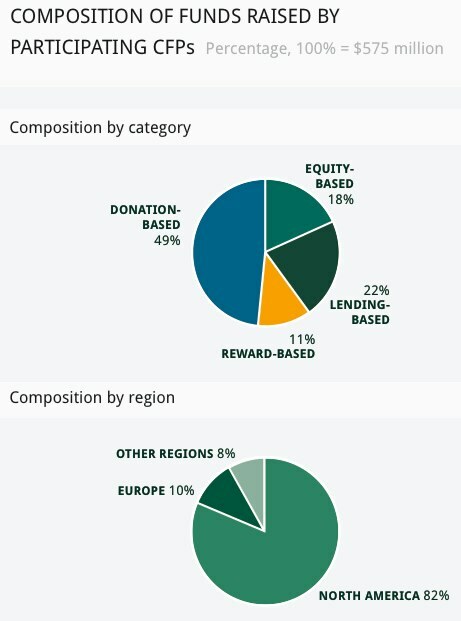 Forty-nine percent of the total $585 million in funds raised by crowdfunding platforms has come through donation-based platforms. Meanwhile, 18% has come from equity and 22% from lending-based models, which remain highly constrained until the SEC sorts out its approach to implementation. 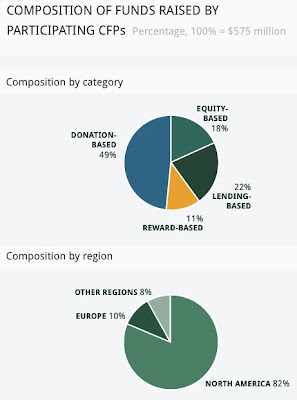 Surprisingly, only 11% has come from rewards-based platforms like Kickstarter. The SEC has until 2014 to create and implement its regulations, which will provide the specific rules of conduct permitted under the JOBS Act. There have been a few previews of what’s to come; the SEC announced back in August that it would create distinct classes of crowdfunding investors, with separate rules for each class. Until the SEC regs are released, pure equity platforms like Crowdfunder are stuck in a sort of legal limbo. It will be interesting to see the SEC's approach, considering their justifiable concerns about the potential for fraud and abuse -- not to mention their naturally self-defensive resistance to any form of deregulation. 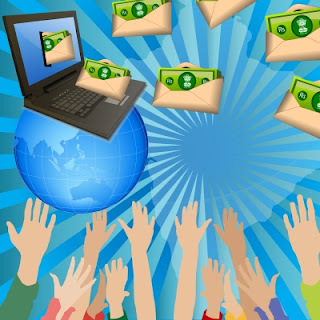 Crowdfunding has become increasingly popular with contributors and fundraisers alike. As an example of crowdfunding's rapid growth in popularity, Venture Beat recently did a story on so-called Kickstarter addicts. Despite its reputation as free – or at least cheap – money, the reality is that crowdfunding is NOT a tax-free windfall. Reward-based crowdfunding proceeds are considered income by the IRS, just like any other sales income. That means that companies raising funds will most likely face some sort of tax liability, especially for wildly successful projects. Many users also fail to read the fine print when it comes to the fees charged by the CFPs. Kickstarter, for example, charges a 5% commission on all funds raised (once the target threshold has been reached). On top of that, there’s a 3-5% fee from Amazon Payments for managing the transaction. The bottom line is that businesses and individuals raising money through CFPs need to factor in the costs and expenses, just like with any other source of capital. Crowdfunding may ultimately prove to be an attractive alternative for companies seeking to raise relatively modest amounts of capital from a large number of investors. That said, companies will need to weigh the costs and risks that arise, including the tax implications and reporting requirements contemplated by the legislation.